We’d love your help. 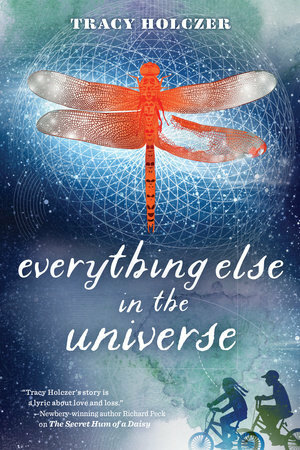 Let us know what’s wrong with this preview of Everything Else in the Universe by Tracy Holczer. Lucy is a practical, orderly person--just like her dad. He taught her to appreciate reason and good sense, instilling in her the same values he learned at medical school. But when he's sent to Vietnam to serve as an Army doctor, Lucy and her mother are forced to move to San Jose, California, to be near their relatives--the Rossis--people known for their superstitions and all around quirky ways. Lucy can't wait for life to go back to normal, so she's over the moon when she learns her father is coming home early. It doesn't even matter that he's coming back "different." That she can't ask too many questions or use the word "amputation." It just matters that he'll be home. But Lucy quickly realizes there's something very wrong when her mother sends her to spend the summer with the Rossis to give her father some space. Lucy's beside herself, but what's a twelve-year-old to do? To ask other readers questions about Everything Else in the Universe, please sign up. Five stars and five hankies. Historical fiction about the Vietnam War and PTSD, but perfectly relevant for today. Not just the PTSD of the returning Veteran, but also of the family. Delightfully rich in the details of life in a large extended Italian family. A beautifully written story of family, war, and friendship. A well written middle grade novel that deftly handled the Vietnam War, veterans, sacrificing for country, and family. No war is without casualties, both physical and psychological. Folks seemed to be particularly divided about Vietnam; some viewing the US's actions as immoral, others believing that citizens have an obligation to serve for their country. But the issue is not black and white, there are no easy answers. Author Tracy Holczer showcases characters who struggle with the effects of such A well written middle grade novel that deftly handled the Vietnam War, veterans, sacrificing for country, and family. No war is without casualties, both physical and psychological. Folks seemed to be particularly divided about Vietnam; some viewing the US's actions as immoral, others believing that citizens have an obligation to serve for their country. But the issue is not black and white, there are no easy answers. Author Tracy Holczer showcases characters who struggle with the effects of such a devastating war. Highly relatable as well as educational, Everything Else in the Universe also offers up a highly palatable portrayal of one close knit Italian American family. Lucy, the central character, has a large, boisterous, very vocal Italian paternal side of her family. As the daughter of an Italian father myself, I relished the realistic glimpse of an Italian family never shy about expressing their opinions. "While Dad had been gone, Lucy figured she'd been trapped in the metamorphic stage of things, feeling her heart harden from the pressure, transformed into something she didn't recognize. But really she'd just been getting tougher without knowing it. While Dad had been gone, she'd been turning igneous so that, eventually, she'd rise again, like Half Dome. Wow! I loved The Secret Hum of A Daisy and this one was just as wonderful. Tracy has a way with words and telling the most beautiful story! Lucy and her crazy Italian family will remain in my heart for quite sometime. Look for this amazing story in June of 2028!!! Why, oh why did it take me so long to get to this lovely, heartbreaking story? I adored the author's debut, The Secret Hum of a Daisy. Beautiful story of family, of friendship and the fallout of the Vietnam war on family and returning vets. Must read! Engaging, interesting view of the Vietnam era. Unique voice. This book was shared through my ARC group, #bookexpedition . Set during the Vietnam War era, it chronicles the life of Lucy who is working to rebuild her relationship with her Dad, who has returned home from the war as a changed man, both physically and mentally. Lucy’s got her Dad’s large, eccentric, superstitious Italian family to contend with as well as a neighbor kid named Milo whose dad is still in Vietnam. Upon digging in her backyard one day, Lucy and Milo uncover a mystery when they disc This book was shared through my ARC group, #bookexpedition . Set during the Vietnam War era, it chronicles the life of Lucy who is working to rebuild her relationship with her Dad, who has returned home from the war as a changed man, both physically and mentally. Lucy’s got her Dad’s large, eccentric, superstitious Italian family to contend with as well as a neighbor kid named Milo whose dad is still in Vietnam. Upon digging in her backyard one day, Lucy and Milo uncover a mystery when they discover artifacts from a soldier buried in her garden. I loved Lucy’s voice and her loud, loving Italian family. There were also many passages I adored that allowed me to see the beauty in everyday natural things, like dragonflies and the night sky. Lucy Rossi, age twelve, and her mother move to San Jose, California to be close to the Rossi family when Lucy's dad accepts his draft notice to Viet Nam, when he could have asked for a deferment because he recently finished his residency to be a heart surgeon. Thus, Lucy is accustomed to being on a tight schedule and she continues this trait when her dad is serving in Viet Nam. Now, he's home again. But he's missing an arm and soon the family learns he's also a different person who needs space. Lucy Rossi, age twelve, and her mother move to San Jose, California to be close to the Rossi family when Lucy's dad accepts his draft notice to Viet Nam, when he could have asked for a deferment because he recently finished his residency to be a heart surgeon. Thus, Lucy is accustomed to being on a tight schedule and she continues this trait when her dad is serving in Viet Nam. Now, he's home again. But he's missing an arm and soon the family learns he's also a different person who needs space. Lucy now has to go next door to her relatives' home and meets Milo who's visiting his grandmother. Together they find a Purple heart, soldier's helmet, and family photos and plan a mission to reunite the items with the owner. In the process, Lucy ponders whether her father will reunite with them again. I loved how Lucy followed her little rituals to remind her of her father. Her rituals were very much like the old rituals her Italian Rossi family followed that comforted Lucy, even when she thought them to be odd at times. I keep thinking that a tween is going to read this book and think that the draft lottery is totally made up. I think that because I am not sure how much anyone young knows about this time in American History. I hope that there a ton of 6th grade History teachers who are putting this on the shelves and in the hands of kids. There is a lot of The Wonder Years happening here but without the first person narration although, I think that might have been better. The third person perspective of Lucy wo I keep thinking that a tween is going to read this book and think that the draft lottery is totally made up. I think that because I am not sure how much anyone young knows about this time in American History. I hope that there a ton of 6th grade History teachers who are putting this on the shelves and in the hands of kids. There is a lot of The Wonder Years happening here but without the first person narration although, I think that might have been better. The third person perspective of Lucy worked, but then why call her parents "Mom" and "Dad" if they never have any perspective of their own? We never see or hear anything without Lucy, so I would I think first person would have worked better. What a lovely book. At times bittersweet, sad, funny, heartwrenching. Lucy is trying desperately to hold her world together when it feels like everything is coming apart at the seams. Her father has returned from Vietnam, but he is distant. Her cousin is no longer her best friend. She has had to move halfway across the country and it seems like no one likes her. It takes a new boy and a mysterious helmet for Lucy to see that maybe things have to change in order to get better. Two additional thing What a lovely book. At times bittersweet, sad, funny, heartwrenching. Lucy is trying desperately to hold her world together when it feels like everything is coming apart at the seams. Her father has returned from Vietnam, but he is distant. Her cousin is no longer her best friend. She has had to move halfway across the country and it seems like no one likes her. It takes a new boy and a mysterious helmet for Lucy to see that maybe things have to change in order to get better. Ok, I may be a little prejudice (round about way related to author), but Tracy Holczer's second novel (found in the youth section at B&N) is really good. Maybe because I was right at the main characters age in the time frame that the story takes place, as well as my brother was returning from Viet Nam, so similar feelings too. Just a wonderful little read about family, feelings, friends, loss and new beginnings. A terrific story about Lucy who worries about her dad. Lucy's dad has been working hard to be a doctor and then gets sent to Vietnam during the war to help tend to soldiers. When he's wounded, he gets sent home early, but with a big cost. Lucy is also making new friends and is close to her big extended Italian family. I liked this story a lot and parts of it made me laugh out loud and parts brought me to tears. I can't wait to see what the kids think of it. A thoughtful and heart warming story of a young girl's struggle to stay strong and dependable during her Father's recovery from injury during the Vietnam War. It hits all the right notes regarding emotional connections and shows the social complexity of the Vietnam era. A wonderful addition to classroom discussions of the time period. A well-written Vietnam war story. I found it tough to get into at first, but with time the story enveloped me with its soft but yet strong voice. I fell in love with this wild Italian family and Milo, the friend with a story only he could tell. I can’t help but wonder however if adults will enjoy it more than middle grade readers with no frame of reference. I, personally, am not a fan of contemporary books. This one, though, was amazing. A truly gripping story, one that I am sure to not forget. I love how Lucy solves a problem that a lot of kids may relate to. I would definitely recommend this book! I really loved this book. The characters were real and you could relate to them. The plot was original and engaging. The author examines several view points regarding the Vietnam War and provides understanding on those perspectives. Grades 4-5 and up will like this one. I was completely drawn in - I started it in the afternoon and had to stay up late to finish it. This story - set in the early 70's - was so dear. The characters are quirky and hilarious, and the story reads really quickly. Excellent young adult book about the power of families and connections, set against a background of the Vietnam War. The book is definitely award-worthy. It is really interesting.